The 2015 Nobel Prize in Physics has been awarded to a Japanese physicist and a Canadian physicist for discovering that abundant subatomic particles known as neutrinos can undergo changes in their identity, a process that requires the particles, once thought to be massless, to possess mass. 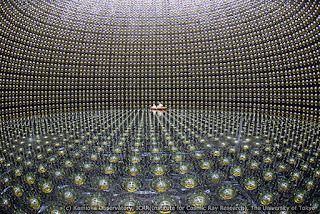 The prize goes jointly to Takaaki Kajita of the University of Tokyo in Japan and Arthur B. McDonald of Queen's University in Kingston, Canada "for the discovery of neutrino oscillations, which shows that neutrinos have mass." The two recipients were leaders of two major underground neutrino observatories on opposite sides of the world. Kajita was part of the Super-Kamiokande collaboration in Japan, and McDonald led a group at the Sudbury Neutrino Observatory, or SNO, in Canada. "Neutrinos are a puzzle and this year's Nobel Prize in physics honors a fundamental step toward unveiling the nature of the neutrino," said Olga Botner, a member of the Nobel Committee for Physics and a professor of physics at Uppsala University in Sweden. "This is a great prize. And it's the third one for neutrinos," said physicist Michael Turner, director of the Kavli Institute for Cosmological Physics at the University of Chicago. Today’s announcement was "doubly wonderful," said Gene Beier, a professor of physics at the University of Pennsylvania who was a U.S. co-spokesperson in for the SNO experiment. Beier had also worked in the Kamiokande II experiment, a predecessor to Super-Kamiokande. Both experiments provided big answers. "Neutrinos are among the fundamental particles," explained McDonald by phone during this morning's Nobel announcement in Sweden. "The neutrino has a mass and it's more than a million times lighter than the electron," said Botner. "Neutrinos punch above their weight. They contribute as much mass as stars do," Turner said. Neutrinos are one of the most abundant kinds of known particles in the universe, second only to photons, or particles of light. Yet they are elusive and mysterious. Even though an estimated billions of neutrinos pass through humans every second, they "pass through our body unfelt and unseen," said Botner. In the 1930s, theoretical physicist Wolfgang Pauli first proposed neutrinos as a solution to a puzzle to explain the missing energy from a type of nuclear reaction known as "beta decay." In a December 1930 letter, the 30-year old Pauli proposed the particle, greeting his colleagues with the words "Dear Radioactive Ladies and Gentleman" in German. He later apologized, reportedly calling his proposal "a terrible thing. I have postulated a particle that cannot be detected." The neutrino wouldn't directly radiate any form of light or electromagnetic radiation. The neutrino was believed to be electrically neutral — making it all the more difficult to detect. Physicist Enrico Fermi gave it the name "neutrino," or "little neutral one" in Italian. They were believed to travel at or near the speed of light. Physicists came to accept the idea that neutrinos were produced abundantly, at the beginning of the universe, in nuclear reactions inside stars and in collisions between cosmic rays and the atmosphere. Most neutrinos pass straight through the Earth undetected. Occasionally they collide with something and can be detected. It wasn't until 1956 that signs of neutrinos were detected in nuclear reactions in experiments led by physicists Frederick Reines and Clyde Cowan in the U.S. Cowan died in 1974, but Reines was honored with one-half of the Nobel Prize in 1995 for the detection of the neutrino. However, much about the neutrino remained unknown. In the 1960s, physicist Ray Davis led experiments studying the neutrinos coming from the sun. On Earth, the researchers detected about one-third the number of neutrinos expected to stream from the sun. Did scientists not fully understand the sun, or was there something going on with the neutrinos? Davis shared part of the 2002 Nobel Prize in Physics for the detection of neutrinos from the cosmos, along with Japanese physicist Masatoshi Koshiba, who helped design the Kamiokande experiment in Japan to confirm Davis's results. Physicists worked for decades to try to solve the mystery of the missing neutrinos. According to the Standard Model of particle physics, there are three types of neutrinos, known as electron neutrinos, muon neutrinos, and tau neutrinos, which accompany charged particles known as the electron, muon and tau particles. The sun produces only electron neutrinos. Some physicists suggested that some electron neutrinos transformed into the other types on their way to Earth. But scientists had to build detectors good enough to solve this problem. They had to be built under solid rock, blocking most other kinds of particles that could drown out signs of neutrinos. 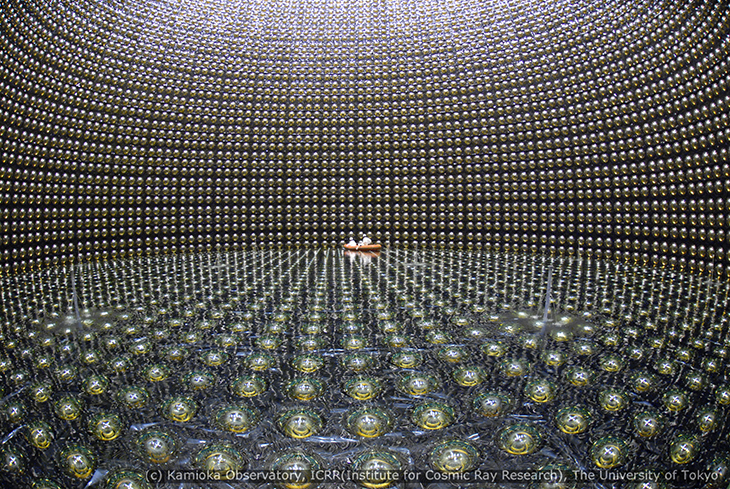 In 1996, the Super-Kamiokande detector went online in Japan. Super-K was built in a zinc mine under 1000 meters of solid rock. Containing 50,000 tons of water, Super-K was designed to detect muon neutrinos from the atmosphere, either from the atmosphere above, or passing all the way through the globe. Occasionally, neutrinos would collide with an electron or core of an atom in a water molecule, and produce telltale flashes of light. This mighty subterranean detector only found signs of 5,000 neutrinos in its first two years. Analyzing their data, the researchers found a difference in the muon neutrinos detected from straight overhead and those traveling through the Earth. They concluded that the muon neutrinos passing through the globe transformed into a different type of neutrino. Meanwhile, the Sudbury Neutrino Observatory in Canada, aimed to study neutrinos from the sun. Similar to Super-K, it was located in a nickel mine. However, it was buried even deeper, under more than 2,000 meters of rock. It detected even fewer neutrinos from the sun, only about three per day in its first two years. Its tank was filled with 1,000 tons of heavy water. An ordinary water molecule contains two hydrogen atoms and one oxygen atom. In heavy water, the hydrogens are replaced by its heavier cousin, deuterium, which has an extra neutron. Several types of collisions can occur in the heavy water, with electron neutrinos producing different reactions than the other types of neutrino. So the researchers could distinguish the electron neutrinos from other types of neutrinos. They found the two-thirds of the neutrinos that were undetected in earlier experiments and uncovered evidence that some of the electron neutrinos were transforming into the other types. "Yes, there certainly was a 'eureka' moment. We were able to see that neutrinos appeared to change from one type to the other," McDonald said today during the Nobel announcement. Physicist Peter Wittich, now at Cornell University, wrote his a Ph.D. thesis on the SNO results, Beier said, but it had to be held as the researchers checked to eliminate possible sources of error in their experiment. He hid the thesis from the public for a year while SNO confirmed its results. What the public may not realize is “that’s the hard part of any experiment,” Beier said, in terms of eliminating sources of error. “Getting the answer is easier than making sure it is right,” he said. If the neutrinos were transforming, as they were later confirmed to be, that had huge implications. Physicists had not known whether neutrinos had zero mass, like photons, or had a little mass. Standard theory suggested they had no mass at all. “Within the Standard Model, neutrinos should be massless,” said Turner. But, if neutrinos were transforming from one type to another, in the way that physicists observed, this meant that had mass. This “provided evidence for physics beyond the Standard Model,” Turner said, and showed “that there was something more to the understanding of particles and forces." So neutrinos may hold the key to expanding our understanding of matter. How do physicists know they have mass, which contradicts the Standard Model of particle physics? Quantum physics suggests that any object, such as an electron, can act as either a solid particle or a rippling wave. Neutrinos act this way as well. Traveling from the sun, neutrinos can act like rippling waves and possess characteristics of all three types of neutrinos. When detected in any experiment, they are recorded as particles and must assume the identity of one of the three types of neutrinos. The relative amounts of the three types of neutrinos that are detected depends on differences in the masses between the three neutrinos. The fact that neutrinos can go from one form to another, and are recorded in different amounts, suggests that they have slightly different masses. Other important experiments on neutrinos have since been done, Beier said. The Kamland experiment occurred a little later. It pinned down the fact that SNO was seeing neutrino oscillations. "We are very satisfied that we have been able to add to the world's knowledge on a very fundamental level," McDonald said today during the Nobel announcement. The discovery of neutrino oscillation lifts the veil a little more on the mysterious neutrino, while at the same time opens a new field of unanswered questions. Ben P. Stein, director of Inside Science, has covered physics as a science writer and editor since 1991; he tweets at @bensteinscience.